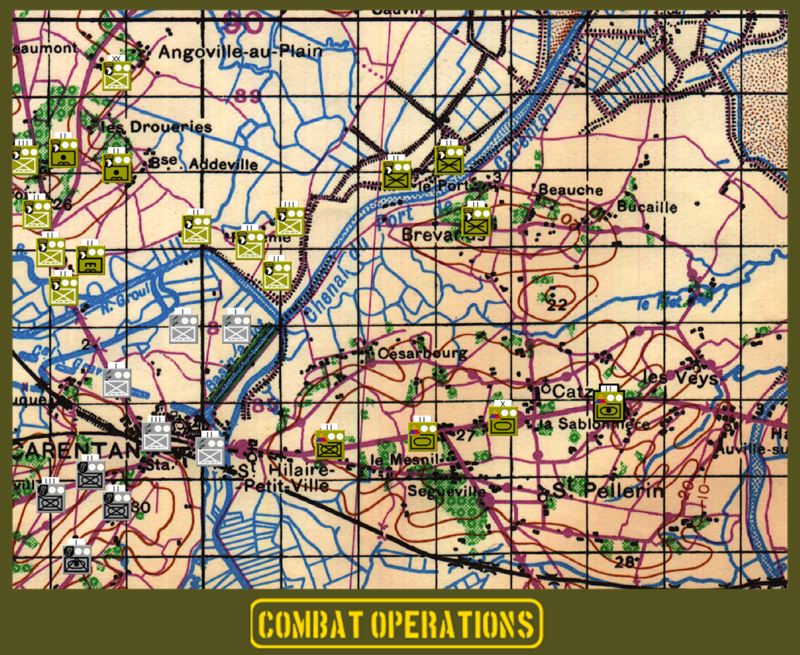 This exclusive preview of Combat Operations is written by Matt, an indie game designer with whom I had the pleasure to chat and exchange ideas during the development of his new game. "The Germans are hitting the 506th hard. Move your Regiment (502nd) into better defensive positions to help slow down the German advance. We are expecting armored reinforcements to arrive soon...we MUST buy time to keep them from retaking Carentan!" These are the conversations that are had when immersing yourself in to the game Combat Operations (CO). This game is not on the market yet, however it is currently under development. Who likes operational level games? Who has a favorite tactical computer game/boardgame/miniatures that would enjoy having a campaign system? Who would like to be part of a command staff and coordinate your efforts with other players? All these things can be accomplished with Combat Operations. The plan is to produce a base game to contain a few scenarios in Normandy, Italy, and Eastern Front in June of 1944. DLC will be available to expand the game scope (play map area, the units, and time scope). Each DLC will be Front specific, so a player can choose to only focus on the DLC for the Eastern Front without needing the DLC for Italy or Normandy. Just to be clear DLC will NOT be immediately available to cover the entire war, and will only be released as development allows. I consider this game to be a new generation in the operational genre for a number of reasons. Most operational games are 1-2 players only, however the plan for Combat Operations is to allow up to 16 players to take active roles in a given scenario. Furthermore, the plan is to develop for mobile platforms to allow a greater variety of ways to access and play the game. Having multiple players in various command roles gives a real "role-play" aspect to the game. Others may view this arrangement as having more people to share the load when issuing orders to troops, and frankly either interpretation would be correct! First, each side must have a player assigned as an Overall Commander for management purposes. Additional players are assigned various subordinate command roles (based on the scenario), and they will be in charge of managing the forces under their command. The plan is to prevent a hard limit to the number of roles a given player may be assigned, so a specific player could be assigned multiple command roles at the same time in the same scenario. Perhaps the most important feature will be the flexibility to allow role reassignment after the game has started. This can be useful if a player drops out, and/or a new player joins the game. It can also be useful in larger scenarios if a unit is cycled out of the front line for an extended rest, and the player could be reassigned to a different unit that is in combat. For instance: in a particular scenario the Americans have a corps consisting of 2 infantry divisions and some corps level artillery attached. There are 3 people that want to play as the Americans. One player is designated the Overall Commander (OC) of the American force, and the other 2 players are assigned roles as subordinate commanders down to regiment level (we are considering allowing down to battalion level...). In this example there would be 2 division commander roles and 6 different infantry regiment command roles in addition to the Corps commander. There are dozens of combinations how the command roles could be distributed among the players. It is important to realize that if a player is unable to complete their move, the OC may complete the turn for any player under their command to prevent a game "hang-up". Furthermore, the OC may remove a player from a command and/or reassign a player to a different command. So if a player has to leave a game due to other commitments, the OC may simply remove the player from that role. It works in reverse too, because we want to allow a new player to join a scenario that is already in progress. If a player is in command of a unit that is going to be out of action of an extended period, the player may be reassigned to participate in a different command role. The point is that there is LOTS of flexibility for player participation and their roles. First I must say that CO is a complete standalone game that can resolve all tactical engagements that occur. Now I have to ask, who has a favorite tactical level WWII game they like to play? I am talking a computer game (or games), tabletop game (i.e. miniatures), or board game! If you like, or even prefer these type of games, CO can be used as a campaign system because any/all of the tactical engagements may be "played out" manually. When an engagement occurs in CO, CO can give players a detailed order of battle and list all environmental conditions that players can take and use to set up their own battles to play out. When I play CO I envision myself auto-resolving most battles within CO due to a lack of free time to play out every tactical engagement. However, there will be those key battles that would be fun to play-out manually with another game like Combat Mission. CO doesn't care what system is used, it only wants the engagement details so it can apply the results. CO will prompt players on the information it requires, before moving on. And this part is for you Combat Mission players out there. Steve at BFC has indicated that IF CO sells well enough, they would be willing to join a mutual effort to create an interface for CO and CM to work together. So when a battle occurs in CO, it could be automagically be played out using CM. Don't believe me? Go ahead and check out the CM forums. So lets talk about actual game play and dive in to a small test scenario we conducted. Much of this was conducted by hand since the game is not fully developed. Keep in mind that the visuals will evolve with continued development, but we wanted to show you the basic concept. 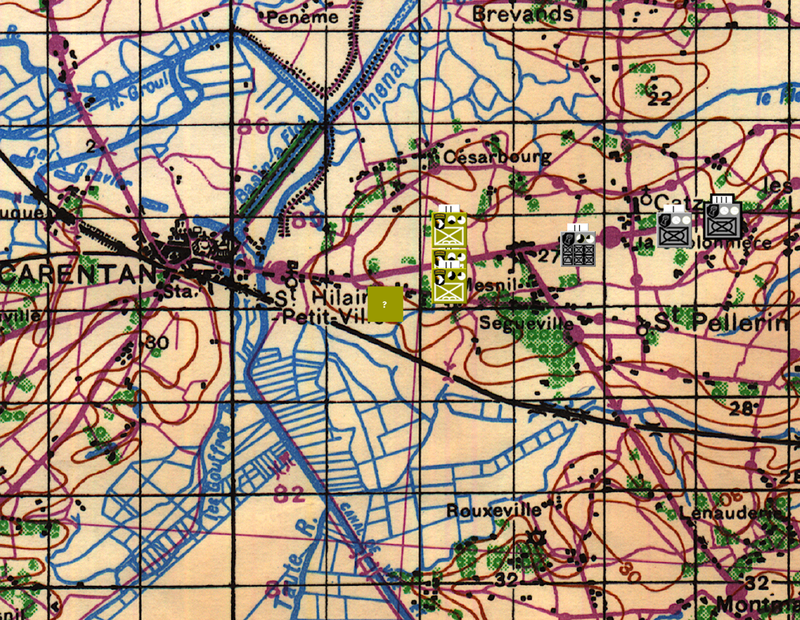 In this test scenario I am in charge of the 37th SS Pz Gr Regt with a company of Stugs from the 17th SS Pz Batt attached. Our opponent is the 506th PIR of the 101st AB. They are blocking our path on the road to Carentan. First off, there are 3 types of movement: March, Approach, and Infiltrate. March movement means a unit is in column formation moving at a steady rate of movement using the fastest terrain along their waypoint (like roads). Approach movement is when a unit is deployed in a combat ready posture anticipating contact with the enemy. So Approaching units move at a slower rate and get no movement benefits from roads, but they are prepared for enemy contact. Infiltrate movement is when small pockets of troops move at irregular intervals to a new location. This is the slowest movement by far, but is the least detectable. For instance German units would likely use this for daytime movement in June of '44 to be a less enticing target for Allied fighter-bombers. Or you can have a unit "melt away" from a front line position to prevent the enemy from knowing it is retreating. 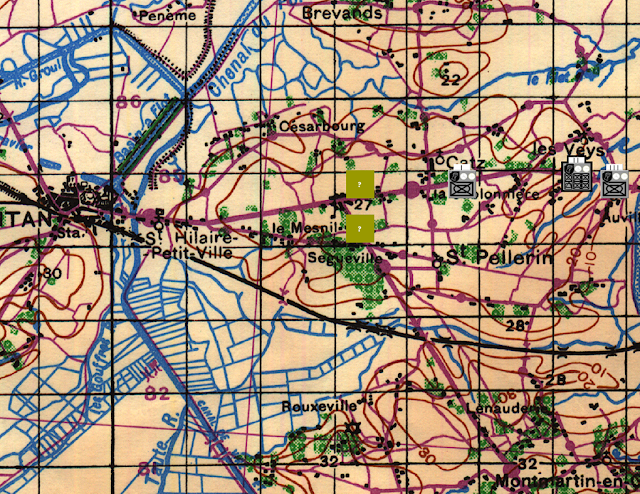 So the 1st battalion of the 37th Pz Grenadiers (I/37 Pz Gren) is given a March order to the river, then an Approach order to Carentan. 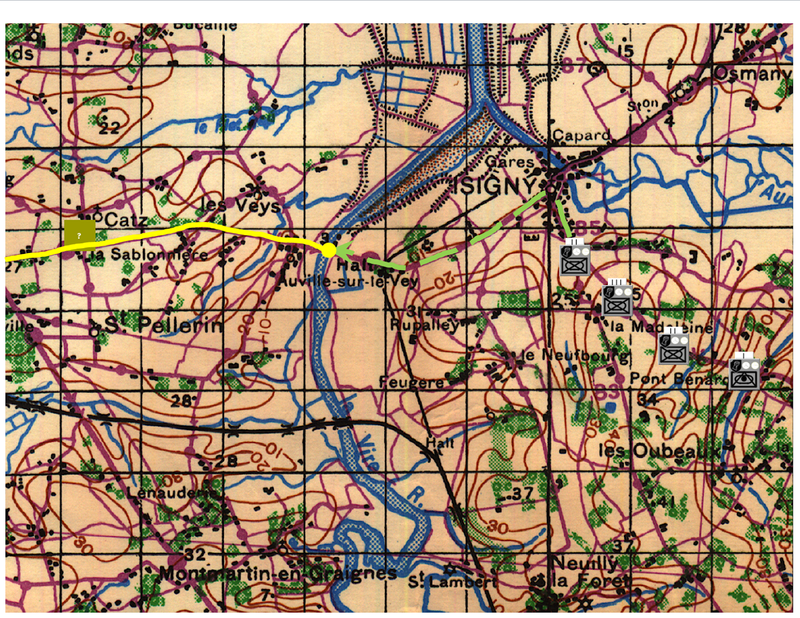 Movement is accomplished by plotting waypoints and each waypoint requires a Reaction (Halt or Engage) and Persistence Level setting (Stubborn, Determined, Cautious) . The probing battalion will have a Reaction of Halt, and I will set the distance to 1200m so they will advance no closer than 1200m to detected enemy units, and a Persistence Level of Determined. Persistence Level helps determine the unit's tolerance to taking casualties in combat. To save time I will have the rest of my troops form a battlegroup/kampfgruppe since I am anticipating combat, but I am not assigning movement orders yet. 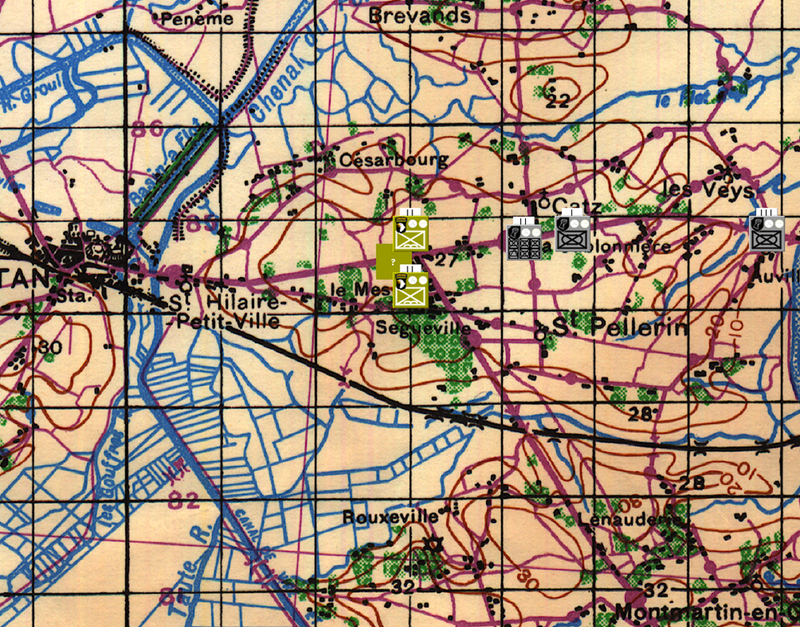 OK, the lead battalion starts spotting enemy positions and advances no closer than 1200m to them. During the next command phase I give the battlegroup that was forming a March Order waypoint behind the screening battalion, then an Approach order (since they are going in to combat) with a Reaction of Engage and a Stubborn Persistence Level. So they are going to continue on their movement path and attack anyone in their way with a high tolerance for casualties. Lets see what happens... OK this is important to note that when the battle group engages the Americans an alert pops up giving players the option to "auto resolve" or manually play out the battle. We will go ahead and auto resolve it, but if the involved players chose to manually resolve the engagement, then each side would be given a full order of battle to use when setting up their battle. Moving on, by the time the German battlegroup receives its orders, moves in to position and commences the attack, there are only 30 minutes left in this 2-hour Action Phase/turn. At the end of the Action phase the player receives a staff report indicating what has happened so far. There will be little information on what exactly is happening in the battle because the battle just started... real commanders lacked these timely details as well. What you do know is that your troops didn't blow through the paratroopers and your troops are meeting significant resistance. So let us press go and start the next Action phase to continue the attack...And the battle rages on, but you have much more info with this staff report since the battle has been ongoing for 2 1/2 hours. The staff report will indicate that they appear to be facing 2 battalions and a probable third, and the battlegroup is making gains, but they appear to be behind schedule. This is a strong hint that the German attack is losing impetus and will come to a halt unless something significant occurs that may change the result (like reinforcements). Let us go ahead and play it out the rest of the way by starting the next Action phase....OK so the battle lasts for another 41 minutes (total 3 hours and 41 minute engagement) the Germans advanced 800m before the attack was halted, then fell back 200m. There were 141 number of casualties sustained, before the BG withdrew from combat. Attacking units that are forced to withdraw remain stationary and await further orders. Furthermore, due to the % casualties sustained the battlegroup lost enough cohesion that they are not capable of further offensive effort until they recover. So let us re-do this part of the scenario. Let's advance with a single company probing and reinforce the BG with the extra Pz Gren companies and see what happens. There is a limit of 6 total companies that can make up a BG, so adding the other two will mean it is at max capacity with 6 companies total. After 2 1/2 hours of battle, the staff report indicates that they appear to be on schedule with heavy resistance. After the next Action phase the battle finally ends after a total engagement time of 3 hours and 34 minutes with the Germans holding the battlefield and forcing the Americans to withdraw. A detailed report of losses will be given, but the Germans sustain a total of 135 casualties and 4 Stugs. The German player wouldn't know this, but the Americans sustained 68 casualties during this engagement. Currently the German battlegroup is reorganizing from the long battle and the significant casualties sustained. Once the BG finishes reorganizing it will continue to follow its movement orders. 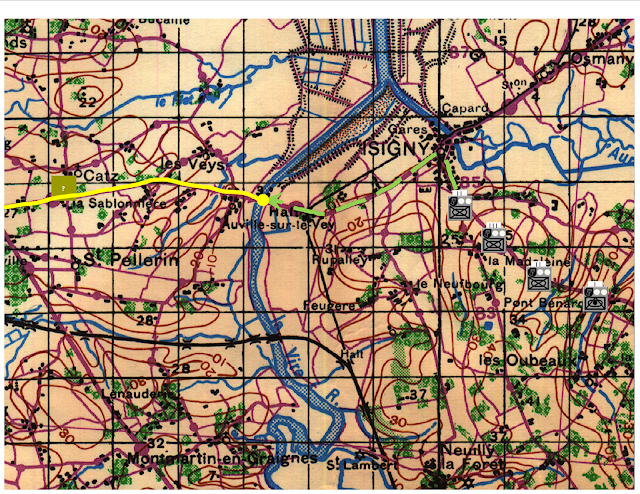 In this case, it will re-engage the paratroopers and continue to fight its way to Carentan. Just like in real life, artillery will play a critical role. Players direct artillery units to perform specific types of fire missions. There are 2 basic types: Reactive and Planned. Planned missions are when you assign artillery to support specific units for battlefield support, or you tell them to hit a certain place at a specific time (bombarding suspected enemy positions, or interdiction fire on a key crossroad). Reactive fire missions are directed against targets of opportunity such as counter-battery, or hitting an enemy unit that was spotted moving. For reactive fire missions the human player indicates the basic fire plan based on a few player choices, and the computer will decide when and how to execute them. Perhaps it sounds complex, but it is fairly simple and straightforward when you plot it out. Supply by itself is a huge part of the game. A player doesn't need to micromanage it, but a player needs to plan with the logistical situation in mind. There are 4 categories of logistics: Food, Fuel, Maintenance, and Ammunition. Food and Fuel impacts fatigue recovery of a unit. For motorized units, a lack of fuel will also mean no movement, and lower maintenance recovery rates. Lack of Maintenance supply will mean lower maintenance recovery rates of vehicles and equipment. And once Ammunition supply reaches a certain point, combat effectiveness of a unit will steadily decline. Virtually all unit types are represented in some fashion. Specifically armor, infantry, armored infantry, parachute infantry, glider infantry, recon, armored recon, field artillery, engineers, AA units, AT units, transport units, HQ units and more will be modeled. Depending on the HQ being represented, an HQ unit can represent command staff only or command staff plus lots of administrative support functions (signal troops, military police, medical troops, repair services, logistic services, etc). While most of the administrative support functions will not show up on the map, their presence is still accounted for. Most combat battalions will have the ability to be split in to their subordinate formations to give players greater flexibility on where and how they are deployed. Otherwise the combat battalion will move and fight as a single cohesive unit. We would like to allow breaking down to the platoon level as well, but that will depend on the development process. It may be something that we provide post-release, but we want to include it now. I have really tried to keep the game as simple as possible on the surface, but there is great depth to the game. My design philosophy has been that military units are going to acti like military units to minimize the absolute need for micromanagement. Players will be able to dig down and see a lot of the different details and factors impacting a unit. For instance, a player can see the number and type of vehicles a unit is assigned, the number the unit actually possesses, and the number that are currently operational. Every unit will have a leadership rating, experience level, morale rating, supply levels on 4 different categories of supply, cohesion and fatigue. These factors will combine to determine if a unit is fighting with full combat effectiveness. Then there will be all the environmental factors such as terrain, and weather. Air power is an important part of this game, but its full use and application is outside the scope of this game and is therefore abstracted. There will be situations where a commander may select areas to concentrate air power, strike key bridges, and we anticipate the use of air transport, but the direct control over the air war will be very limited. Air power will impact the ability of a unit to receive supply (air strikes on resupply), allows for greater artillery effectiveness (air spotting), better spotting of units behind the lines (air recon), limit the ability to move without being attacked, and allow for limited close air support. Sounds very interresting, I would definitely consider backing this Kickstarter project. I especially like the potential integration with Combat Mission, and the fact that WEGO is used. I much prefer this over IGOUGO, which I find to be basically both sides taking turns at running circles around each others stationary units. Having simultaneous movements/order execution is much more realistic. Really like the sound of this. Superb that as an indy developer your getting in so much detail and depth. The upto 16 players sounds good on paper but not sure how often that's going to happen and thank god your making it single player aswell..otherwise it could well have become way to niche abit like Battle Command which also is very detailed but no AI has really held it back I feel from a wide wargame audience. I'm certainly extremely impressed and this has gone on my to buy list with out a second thought. I've posted about it on Tactical Wargames Facebook page with a link to this article. If you ever have some exclusive screenshots etc I'd be more than willing to put them up ion TW. JC an idea has just occurred to me and want to run it by you. Email me at J__Rimmer@hotmail.com. Kind of in away fits in with what you want to achieve with regards to blogging\writing. Is there a rule that war games have to visually unappealing to be taken seriously? These are very exciting times for Matt and I am sure he will appreciate your support. I would like to understand better your position about this. I ask you because I've seen people criticize Combat Mission Black Sea, Scourge of War Waterloo, etc on the lack of visual appeal. I need visual stimulus to be immersed in game play. Unity of Command is a beautiful game that plays smoothly and is visually appealing. Vietnam 65' is another game that looks good, and plays well. These are both examples of productions by small development teams. UoC was developed by a 2-man team - V'65 was a one-man show with artwork done by contractors. I have criticized CM in the past. To venture into 3d gaming worlds is a bold move for small development teams. I enjoy CM, but the engine is old and needs optimization to run smoother. Things like ragdoll animations and vehicle physics don't exist - or are in need of improvement. Your point is well taken, Mike. But the big question is: are we willing to pay for those graphical goodies? I am. Most of the people who frequent forums, not quite. I think people need to realise that small indy wargame developers just don't have the funds for fancy graphics and would be lucky to make enough from sales to pay for it. Personally as long as it's not colour clashing and the maps are detailed and easy to suss out I'm fine with it. I'd much rather their time went into gameplay and depth. Remember books have no pictures and a game can be very immersive with out having to look amazing but by using other gameplay mechanics which stimulate the imagination. I would say looking at the screenshot the map could look much better using a different colour scheme and making sure it doesn't look confusing. Remember there are lots of superb looking board game maps and counters out there. Just because a game may be 2D it can still look fantastic. Oh and I think most coders aren't artists and when it's just a one man show with some part time help then it can be a case of no one that good at art working on it and it's way to expensive to hire someone. I know it's an issue on a game I work on. You are absolutely right. For me, particularly the artists behind the Lock N Load series are fantastically talented artists. Correct Jason, indie developers are in a "take what we can get" situation. The programmers are not graphic artists, but we are tapping in to some graphical talent. By the way, I am willing to talk with any graphic artist out there that wants to volunteer their services. Anyway, my preference has been to focus on depth, reality, and game play that is simple to execute, but difficult to master. The images are fairly simple to change over the course of development, and what you are seeing are the early stages. I will add that I am leaning towards keeping the map. Why? 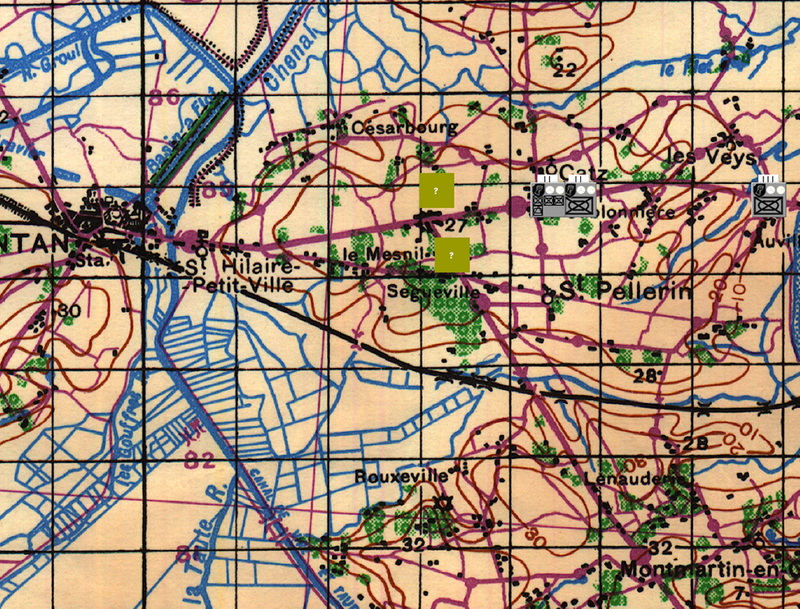 Because it is an authentic map from Normandy in 1944 that I scanned in. So you would be moving units around on the maps that real commanders were doing the same. ...and that is just cool to me. But I will listen to the feedback. The ability to play a campaign game, and then to take a situation and an order of battle and instructions and play it out on a different gaming system as a means of resolving combat, to my mind, it the Holy Grail of Wargaming. If they can make that happen in other gaming systems, I may be back into those systems very soon. I love the operational concept of the game, but I no longer have the patience to work with interfaces which take so much work. Maybe realistic maps may have seemed like a good idea, but it's just a jumble of colors. I don't expect beautiful graphics, but clean, clear and useable UI is a must. 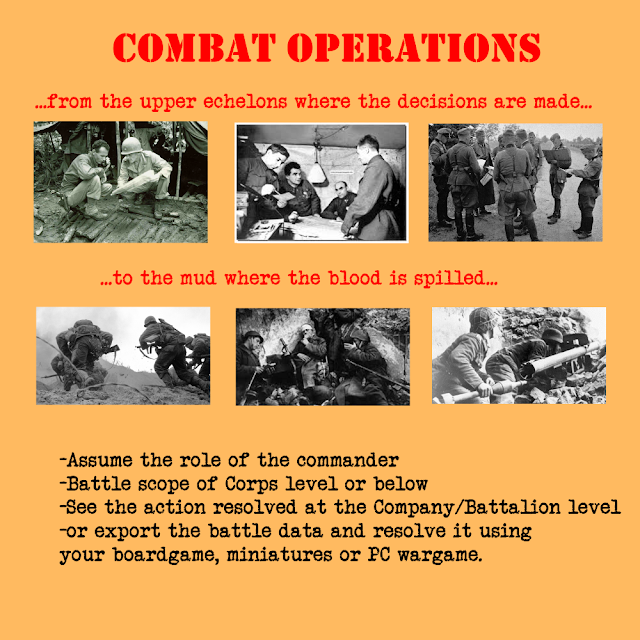 If you're in need of inspiration, check GMT board games for how to create a counter, or CommandOps for how to present information on a computer. I wish you the best of luck, sadly you're going to be targeting a niche within a niche within a niche with those screenshots, but I hope it works out for you. I'd be very interested in this, particularly if it ever gets to the point of being able to smoothly integrate with Combat Mission. I think WEGO is an excellent choice. I think it's pretty early to be busting the developer's chops over the graphics. He's still working on the engine. You don't look at a building where the builders are still pouring the foundation and complain about your impression of the interior design based on some mock-up graphics. Sure, some feedback about the importance of clear graphics and clean maps is a good reminder, but it seems premature to be concluding that the game will have bad graphics. I could go on for a bit about gamers, wargames, and expectations of graphics but that's probably more appropriate on my own blog than here! At any rate, I would KS fund this. The idea here is exactly the same as that in Campaigns on the Danube, a Frank Hunter game exploring the operational aspects of Napoleon's 1805 and 1809 campaigns that can have the tactical battles played out with miniatures or any other tactical Napoleonic system. It's a good concept, as long as, as in this game, there's an option to auto-resolve. dinsdale, I agree that manual interfacing is far from ideal. If CO does well enough, then BFC will partner with us for an interface. You can read it on their forum! However making CO and getting a large ehough audience to make it worth BFC's resources has to happen first. For that matter, I am willing to listen to any corporate sponsor that wants to create some sort of interface! Sadly you have a very valid point with CO. My game name has evolved over the last 2 years, and recently derived to CO...I am not opposed to changing the name, but this is where I am at right now. I too applaud this effort, and syncing it with Combat Mission would be most excellent.. however the real problem with any port to CM is going to be the map... there is currently no way to create a map on the fly from a program such as this that can be used in a CM game. Solve that problem and you will indeed have a winner on your hands. I hope this is successful and that the port to CM (in whatever form it takes) actually happens. Bil is right about CM maps being one limitation... 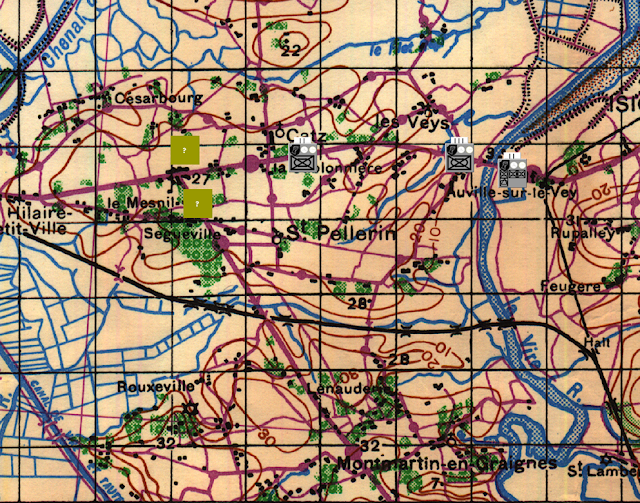 But BFC has started shipping games with Master Maps now that cover large areas of campaign territory for Market Garden and Bagration. In Normandy, we have two user made master maps that cover the entire XIX Corps front in the July battles for Saint Lo. It's not automatic to cut out a map section and detail it for a CM battle, but doable. CO Operational Maps would/could/should be targeted to take advantage of existing CM maps. As the community pitched in to expand the collection of master maps the operational coverage would expand . The CO map editor would have the capability to import and display an "underlay" of a scanned WW2 era map and allow the map maker to draw in the features (terrain, elevations, roads/rivers) AND to also export a similar overlay for use with the CM map editor. Bil, thank you very much for the applause! You are correct that the map is a significant issue to resolve, however as anonymous just pointed out the master maps could be part of the solution. Of course none of this matters till BFC agrees to work with us on an interface. So that means we have to generate the funds in our KS campaign to make this game! Please don't listen to the guy re graphics and Unity of Command. The look and gameplay of that game stop me from playing it every time. Graphics need to be clean and clear but overall fit the function, and if the game plays well it will carry itself through. The world doesn't need another good looking but rubbish game. I wish you every success with this - I am a combat mission player and would buy this if it was available. UoC graphics using busts etc actually takes away immersion for me same as seeing huge generic tanks for an armour unit..I'd rather see a counter with a NATO symbol on or for those who have trouble with NATO symbols an icon of said unit. Anyway back to game. I'd much prefer it if Coy instead of Battalion was the game scale. With the possibility of Coy's breaking down into platoons. Or have scenarios at Battalion scale and others at Coy. As a CM addict I keep my fingers crossed for your success. Please swing by and make a donation if you evaluate this as a worthy venture! Have you ever looked at the map graphics from UoC? They were hand drawn. You can't say that's not impressive.